When the veil between worlds thin, and the ghosts and spirits come to visit … and the frost is on the Jack O’Lantern … Well, you know what that means! 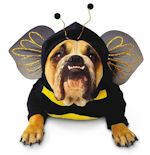 Time to dress up those pets and head in to Rainbow Ag for the annual Halloween Costume Contest and Sale! Saturday, October 27th, at both Rainbow stores, bring your favorite ghoul in costume and save 20% on your purchases! (Some exclusions apply). There will be an in-store Costume Contest at 12:30 PM in each store, with prizes in 3 categories; Small dog under 25 pounds, Large dog over 25 pounds, and Most Unique Pet (non-K9). There’s also special fun all day! Just bring your pet in costume to save 20% on your purchases, and don’t forget that the clothing department is swelling with all the new fall clothing arriving daily! It’s a great time to get something warm and cozy for yourself or a friend and be ready for the coming cool weather. You can save 20% on jackets, sweatshirts and boots! Or perhaps that 20% will go toward some pet food, a new bed for your best friend, or a special treat. Join in the fun, and head to Rainbow on Saturday October 27th, for all the spook-tacular fun! The Humane Society of Inland Mendocino County has a great fundraiser coming right up, on Saturday November 3. 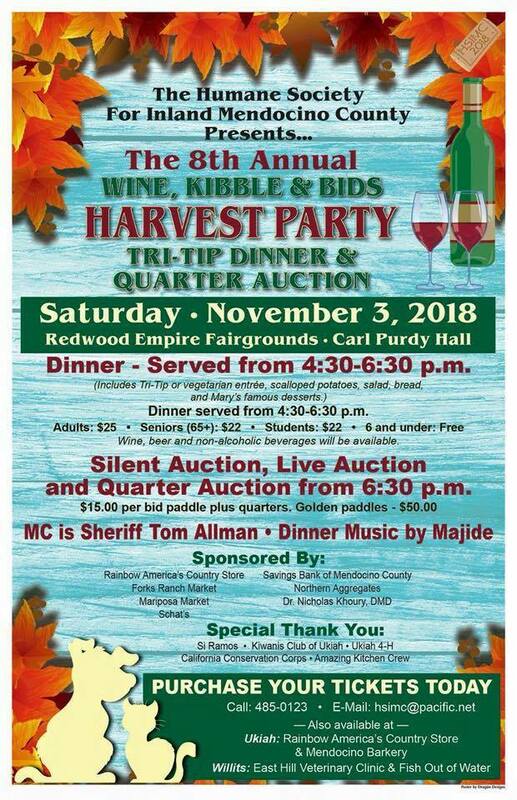 The 8th Annual Wine, Kibble and Bids Harvest Party Tri-tip Dinner and Quarter Auction will be held at the Redwood Empire Fairgrounds in Ukiah. 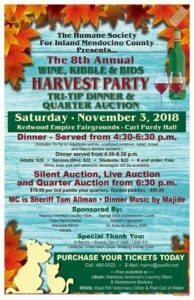 Dinner is served between 4:30 and 6:30, then the fun begins with Silent, Live and Quarter auctions, with MC Sheriff Tom Allman. Get tickets now at Rainbow Ag in Ukiah, or click here for more information. The leaves are falling, the firewood needs splitting and the gutters need to be blown out. It’s Fall and all those chores are not going to get done by themselves! Lucky for us, there are power tools to help us out and a SALE on those power tools, just when we need it! November 2 & 3, come in for the Cost + 10% Outdoor Power Equipment Sale! Get any chain saw, blower, mower, trimmer, log splitter, chipper, pole saw … all power equipment is on sale for only the Cost + 10%! And, Rainbow’s OPE specialists will be on hand to help you choose the right tool for the job. 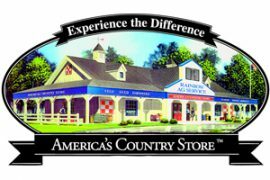 That’s Friday and Saturday, November 2 and 3 at both Rainbow Ag stores! 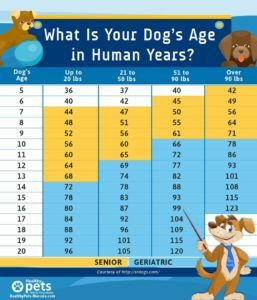 Keep your older pet happier! Click here for article. Orphan Dog does so much work on behalf of the homeless animals in Lake County, and they could use some help too! If you are interested in fostering or volunteering, check out their website, and if you are looking to add an new four-legged family member, take a look at the adoptable dogs page. They have puppies, puppies, puppies! And also some wonderful older dogs who would really love to spend the winter sleeping by your side. Orphan Dog is also working on a special project: to offer a free spay/neuter day with the goal of 200 animals! To donate or get more information, follow them on their Facebook Page. This entry was posted on Friday, October 19th, 2018 at 3:03 pm	and is filed under News, Rainbow Wags Newsletter. You can follow any responses to this entry through the RSS 2.0 feed. Both comments and pings are currently closed.